Shimla, Feb 10 (IANS) With the interiors of Himachal Pradesh still recovering from last week's heavy snowfall, the weatherman on Sunday forecast more rain and snow for next week. "Some areas are likely to experience snow and rain from February 14," an official of the Meteorological Department told IANS. The official said that chances of snow in the upper reaches of Shimla, Kullu, Kinnaur, Lahaul and Spiti, Mandi and Chamba districts were high. Meanwhile, Keylong in Lahaul and Spiti district was the coldest in the state with a low of minus 11.6 degrees Celsius. The minimum temperatures in Shimla and Manali were 2.5 degrees Celsius and minus 2 degrees, respectively. Kalpa, some 250 km from Shimla, saw the night temperature at minus 4.6 degrees Celsius, while it was 4.2 degrees in Dharamsala and 1.2 degrees in Dalhousie. 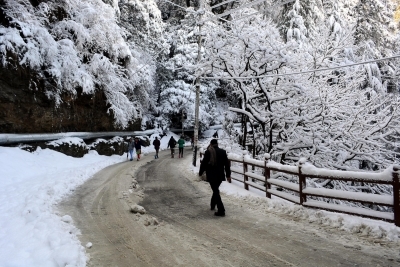 Snow could still be seen in certain areas of Shimla like the Mall Road, the Ridge, the US Club and Jakhu hills. Areas near Shimla like Kufri and Narkanda and the popular tourist resorts of Manali and Dalhousie were still covered under a thick blanket of snow. Officials said large parts of Kinnaur, Lahaul and Spiti, Pangi and Bharmour were still cut off due to snow. Efforts were being made to reopen them.